Veteran Unemployment Rates | Propel L.A. Veteran unemployment rates were higher than the nonveteran rates between 2009 and 2013, except in 2011. However, the disparity began to close in 2014. From 2014 to 2016, the gap between veteran and nonveteran unemployment rates decreased with a higher proportion of veterans employed than nonveterans in 2016.
Who is unemployed? Unemployed persons are those who did not have a job, were available for work, and were actively looking for a job in the 4 weeks preceding the survey. Technical details: In general, Propel L.A. uses the U.S. Bureau of Labor Statistics (BLS) or the CA Employment Development Department (EDD) for unemployment rates. 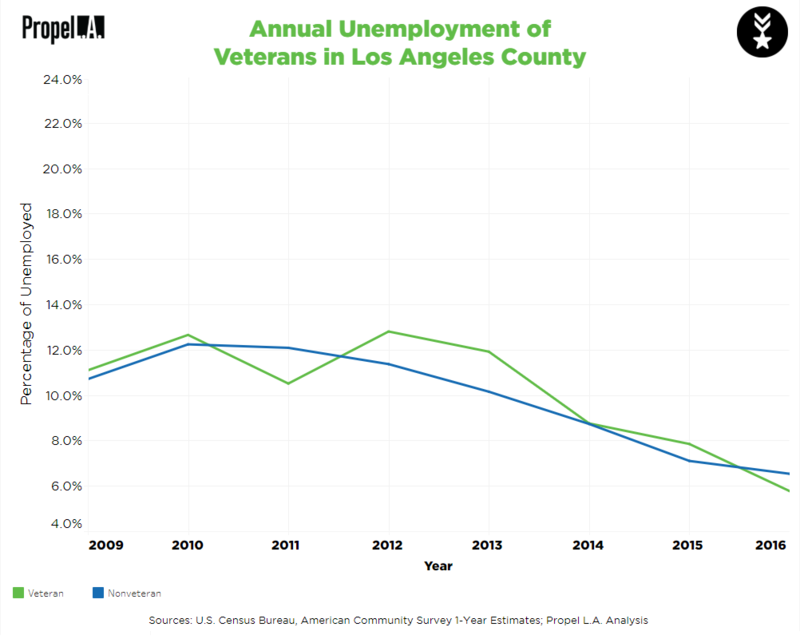 However, neither sources provide the annual veteran unemployment rates in Los Angeles County. Therefore, Propel L.A. utilizes the American Community Survey (ACS) for this metric since such data is available in the ACS.